Mater has been built on a tradition of giving—from the Sisters of Mercy who gave their time and compassion and the doctors and nurses who gave their expertise and knowledge—to the members of the community whose donations built our first hospitals. Our team of health professionals—including clinicians, support services staff and team of volunteers—perform a diverse range of roles, but we are unified by our commitment to provide exceptional care to our patients. 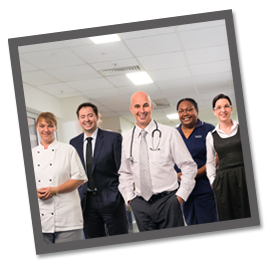 Mater People provide compassionate, quality care in line with the Mater Values; and have done so for more than 100 years. You may only pass through the doors of Mater briefly during your journey, but we know it’s these moments that will be remembered forever. Our people define our organisation. And it’s our people that are valued most by Mater and our patients.